A very charming glass-panelled cabinet with carved diamond relief has been made using reclaimed timbers adding to it’s character. A most unusual cabinet with it’s particular shaped glass panels that reflect in some way the diamond blocks below only adds further to it’s unique and attractive look. 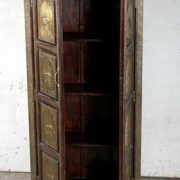 Constructed from reclaimed timbers and found deep in Jodhpur this cabinet resonates skilled craftsmanship, history and culture. 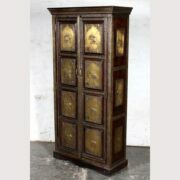 A charming cabinet, with it’s upper display area and storage below could be used in a multiple of different settings within the home.